We have been working in the garden, the past few weeks, and it is so fun to see things starting to grow. I HATE to weed but boy do I love when the veggies are ready to harvest! We sat on my mother in law’s patio last night and shelled the peas. It so amazing how much work goes into peas and it’s totally worth it to get the luscious little nuggets. One of my favorite veggies! I’m all about the fresh produce right now. I love the colors and I love the flavor it brings to your dishes. A great way to get picky eaters to eat their veggies. I have picky eaters at my house and I never know if they will like what I have cooked for them. My Andie came home from umpiring last night and devoured this pasta. That’s a good sign because that’s her way of giving it two thumbs up! Before you start, cook and chop your bacon, and cook pasta according to the package, and set aside. In a large skillet, on a medium heat, heat 2 Tablespoons of olive oil until it’s hot. Add the chicken and cook on one side on for 1 minute. While it cooks, sprinkle the uncooked sides with paprika, salt and pepper. Flip the chicken over, and cook on the other side for 1 minute and sprinkle with the paprika, salt, and pepper. Flip chicken over again and cook, for several minutes until the center isn’t pink. Remove chicken from the pan. Slice chicken into bite size pieces. 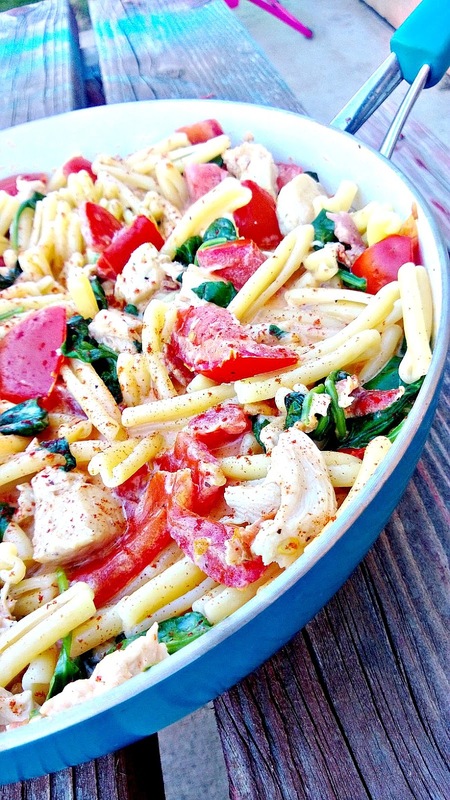 In the same skillet, add chopped tomatoes, spinach, garlic, chicken, bacon, and Sriracha. Gently mix everything together. Add the half and half and bring the mixture to a boil, stirring constantly. After the half and half starts to boil, add the Parmesan cheese- reduce heat to simmer and stir. Let the cheese melt and the spinach reduce, about 2 to 3 minutes. Remove from the heat and season with a little paprika, salt and pepper. Add your cooked pasta to the skillet. Sprinkle with the remaining Parmesan cheese and enjoy! I don't like too much hot either but this just gives it flavor! Hi Kimberly, I would love you to stop by Food on Friday: Pasta over at Carole's Chatter to add this to the recipe collection! Cheers! This recipe sounds absolutely amazing! 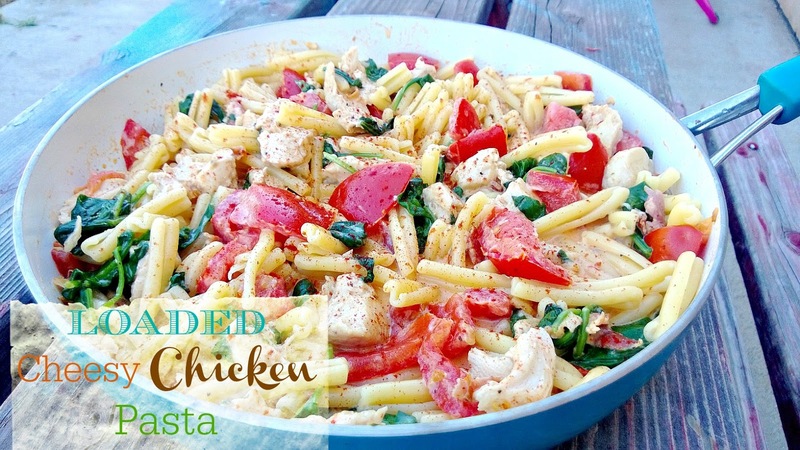 I love pasta and this also sounds so healthy with the chicken and spinach that I am definitely going to have to give it a try! Thanks for linking up at the Wonderful Wednesday Blog Hop! Gardening is definitely a labor of love. Depending on my mood sometimes I love it and sometimes I despise it. I always love the fresh produce though! This pasta looks delicious! Oh wow more fresh veggies and this time with pasta! Thanks again for sharing! This is a great Cheesy Chicken Pasta that we will really enjoy. 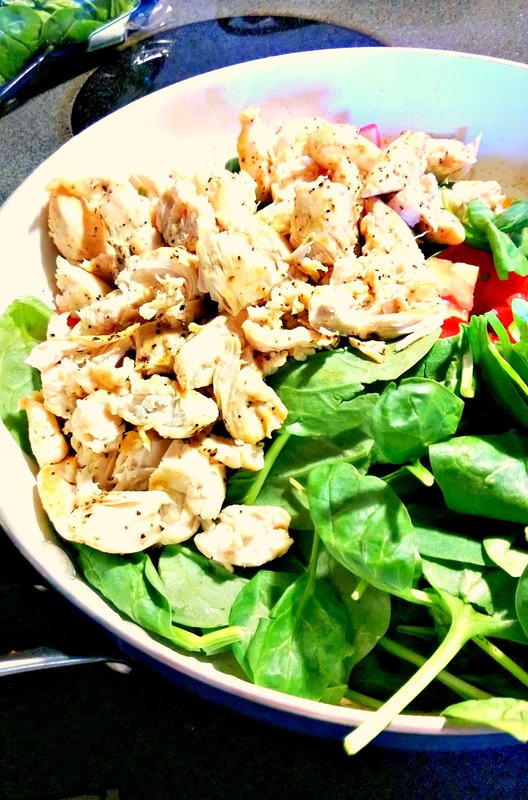 Thanks so much for sharing your post with Full Plate Thursday and have a great day! Oh my! Looks amazing and even makes me hungry! This is a perfect dinner recipe! Pinning! I always love when you link up with us! This recipe looks delicious and I know my family would love it…I'm definitely making it soon! Thanks so much for sharing at Share The Wealth Sunday!